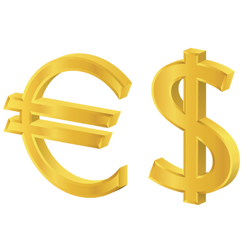 The dollar strengthened against the euro on Thursday after important economic data releases from the US and Europe. The European Central Bank made a surprise move to cut interest rates given the recent levels of low inflation and the move seemed to catch many investors off guard as the value of the euro fell. US economic data then showed that the economy grew faster than expected in the past three months, with the euro/dollar pair falling sharply before recovering slightly. The euro had a good day on Wednesday, rallying against other currencies after stronger than expected European economic data boosted spread betting investor sentiment. In addition, the record breaking Dow Jones and reduced expectations that the European Central Bank will cut rates helped the EUR/USD pair climb to $1.3547. Of course, today's ECB meeting will be key to the currency pair's short-term direction. The looming European Central Bank meeting put pressure on the single currency on Tuesday, with the euro-dollar pair slumping. The euro has come under fire this week after the Eurozone's inflation measure fell, with some investors speculating that the ECB will now either cut rates or hint about cutting rates in the future. The dollar also strengthened against the euro after economic data showed that US service sector activity increased during October. The EUR/USD pair climbed from its lowest levels in over a month to reach a high of $1.3511 during trading on Monday. The euro remains under pressure ahead of the upcoming ECB meeting on Thursday despite strong economic data showing Eurozone manufacturing edging higher in October. The euro fell towards two week lows against the dollar on Friday, with forex investors looking ahead towards the upcoming European Central Bank Policy Meeting. Investors remain concerned over the possibility that the ECB would cut rates even further after data on Thursday showed that inflation has fallen to a four year low in the Eurozone. EUR/USD closed at $1.3492, falling 0.68% for the day after positive ISM data from the US. We saw a sharp nosedive in the euro against the dollar yesterday on the back of disappointing economic reports which suggested that, despite coming out of recession, the Eurozone's future remains challenging. Inflation unexpectedly declined and unemployment climbed to a record 12.2%, which saw the EUR/USD forex pair tumble 151 points to $1.3583. It appears that the Federal Reserve's decision to maintain the pace of asset buying was linked to concerns over the potential negative impact of the partial government shutdown. As such, investors kept one eye open and started to unwind the previously established long EUR/USD positions. Consequently, the common currency held to its downside trajectory, losing 11 points to $1.3735, and is still on the back foot at the time of writing.